Known for its pristine growing and harvesting conditions; Yakima Fresh is proud to offer only the best pears that the Northwest has to offer. As perfect as a bright, summer day; our pears provide excellent flavor and texture that complement their nutritious value for the world to enjoy. Select a variety to view it's description and PLU information. Ripens to bright yellow. Aromatic, perfect for fresh eating. Very sweet and juicy. Excellent for canning or cooking. Highly aromatic, sweet-spiced and flavorful pear. The dense flesh makes this pear ideal for baking and fresh eating. Brown and often russeted, there is no color change when ripened. 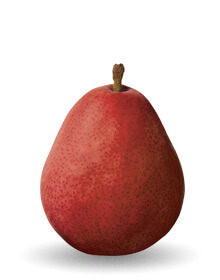 Bright red skin when fully ripe, with a very distinctive sweet pear flavor. Delicious snacking pear, great in salads, and also an excellent canning pear. Abundant juice and sweet flavor when ripe. This varietal become light green and soft to the touch as they ripen. Excellent pear for wine-making, fresh eating, salads or baking. Remains maroon to crimson red when ripe. Very sweet and juicy, with off white to creamy pink flesh. Colorful and elegant dessert pear or delicious eaten out of hand. This smaller variety turns bright yellow with crimson freckles when ripe. Sweet and juicy to the taste, this varietal is excellent for dessert or snacking. Tiny pears with ultra-sweet flavor, maroon and olive green in color. Excellent choice for children's snacks, pickling, or as a garnish. No color change when ripened. Cross between a Comice and Conference pear. 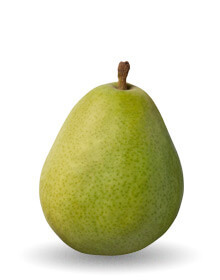 This juicy, fresh eating pear has a slightly crisp texture with mellow sweetness. Unique in flavor, this pear is delicious when used in salads, jams, preserves or as a dessert pear. 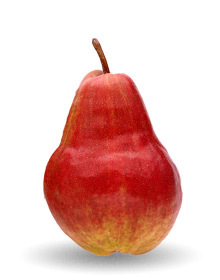 Also known as the “Christmas pear,” this elegant varietal works well with cheese or desserts. Slight color change when ripe, the Comice is very large, juicy and sweet to taste.